i remember when i first heard about bikram’s asana championship (was it in 2002?). i was absolutely appalled. how could there be an asana championship when asana is a state of mind far more than a state of body? were they going to attach electrodes to competitors’ heads to see who was the calmest? fast forward to 2018. i’m still appalled by the asana championships. even more appalled by the effort to get yoga into the olympics. this practice is, by definition, intended to be noncompetitive. does classical yoga philosophy and theory mean anything in today’s world? and now…enter instagram and its ubiquitous yoga challenges. last month, for the first time, i was invited to co-host a challenge. i gladly jumped in as, to me, instagram is just playing games. there is nothing serious about it. i didn’t see it as a competition, just a fun forum for a bunch of people to try some silly postures together. i can hardly call it yoga…let’s just call it random bendy made-up partially contortive and balance-y poses. 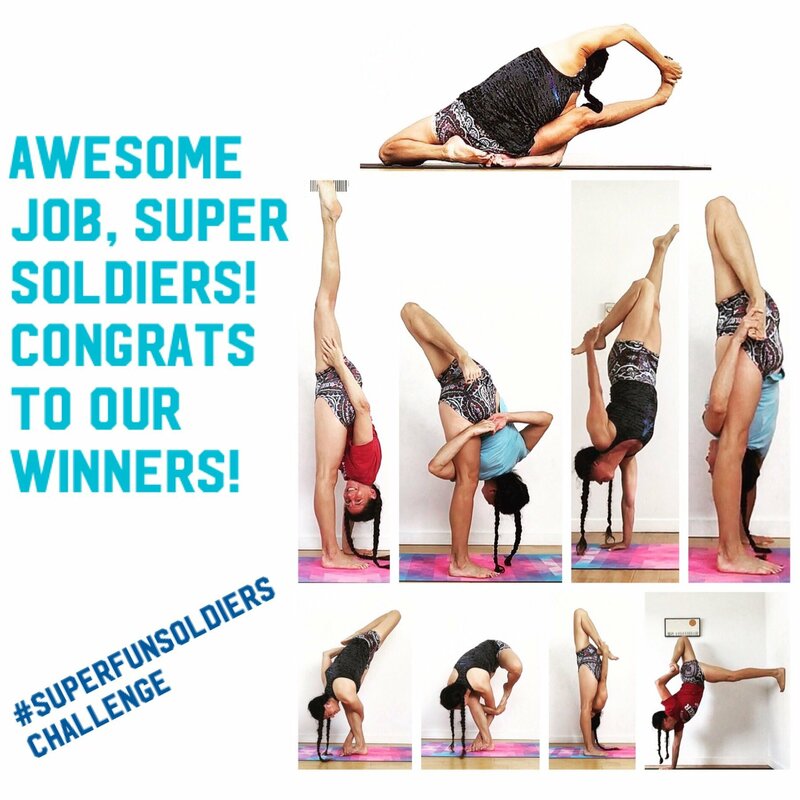 i had a great time co-hosting the #superfunsoldiers challenge with three adorable women who always make me smile (@renny_sito @yogi.hemaxi @suchitra_rx) and was so flattered that they invited me to join them. then it was time to select winners for the prizes. that’s when the s#!t got real. this wasn’t just fun and games. i just threw myself in as a judge of an actual yoga competition. i was suddenly sick. the winner i chose was a guy from sweden (@lukas_mattsson) who really, really threw himself into the challenge. he posted religiously, put our link in his bio, and tried so hard to do the postures. i have to be honest, his poses weren’t pretty, but his heart and soul were in it. and isn’t that what yoga is all about? as we went through all the participants, i got very emotional. i actually cried over it. so many people trying so hard and posting such lovely photos. i’m not a participation-trophy kind of a girl, but i really, really wanted everyone to win. not necessarily a prize–do we, as yogis and yoginis really need more stuff?? ?–but recognition. a list of all the hundreds of people who gave it their all. no matter what instagram says, yoga is not about how you look in a pose, in an outfit, or even naked. yoga asana is about a comfortable, steady seat, a mind that is tranquil and sweet, and a stillness that transcends it all. to me, everyone who rolls out a mat is a winner. no matter what you look like on instagram.